Penang Hill Funicular Train will resume in mid March 2011? New Swiss-made coaches to replace the old Penang Hill’s funicular trains. Penang Hill’s funicular train stopped its service on February 22 2010 for a RM68.8mil upgrade process. It is said that it will complete in 7 months but it seems that it will take longer. 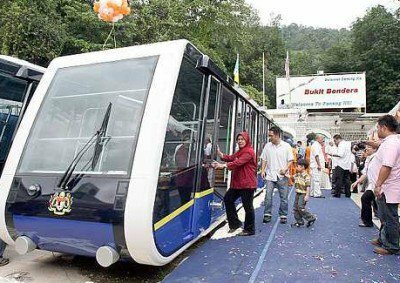 Now the latest claim is that the new Penang Hill’s funicular train will resume in mid March 2011. Can’t wait for the fresh air on top of the Penang Hill. The upgraded system will travel non-stop and will not require passengers to change trains half way up or down. And there will be air-conditioned coaches. It will take only 10 minutes (it takes 30 minutes previously) to travel from base station to hilltop station and vice versa. The new coaches will be able to carry 50 passengers each. Still there are no news about the ticket prices for the Penang Hill’s funicular train ride. Welcome back Penang Hill! I LOVE PENANG! PENANG ROCKS! Any news update about Penang Hill’s Funicular Train, please comment! Before that, let’s look at theStar’s report about Penang Hill’s new funicular train. Next story iPad 2 with 1.2Ghz CPU, Camera, Thunderbolt Port, Bluetooth? Previous story White iPad 2, anyone?